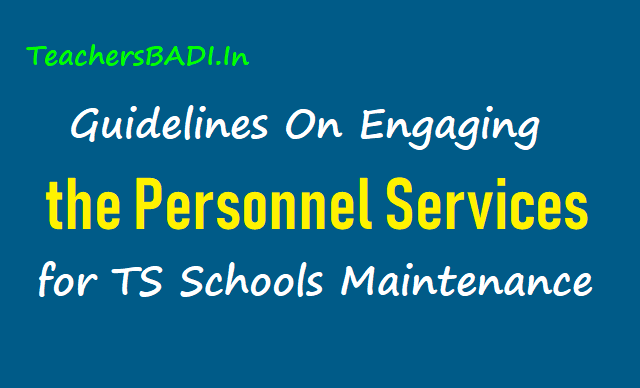 Sub: TSSA, Hyderabad - Guidelines on engaging the services of personnel for maintenance of schools during the academic year 2018-19 - Reg. Services of one person for maintenance of toilets, cleaning of School premises, watering of plants etc., is permitted under SSA for the academic year 2018-19 for a period of 10 months. 1. An amount of Rs.2,000/- per month (Max) has to be paid to the person in the Schools with enrollment up to 40. 2. In case of the Schools with enrollment above 40, Rs.2,500/- per month (Max) has to be paid to the person. 1. The person has to attend the School at 7.30 AM and stay in the School till the closure of School hours. 2. To clean the School premises, Classrooms and toilets in the morning and evening as required. 3. Watering of the plants in the School premises daily. 4. Providing water in tubs in the Toilets wherever running water not available. 5. Providing drinking water to Children. 6. To attend to the duties assigned by the Headmaster during the School Hours. 1. Services of one person for maintenance of Toilets and Day Watch & Ward is permitted under SSA for the academic year 2018-19 for a period of 10 months. 2. An amount of Rs.2,500/- per month (Max) has to be paid to the person towards monthly Honorarium. 1. The School Management Committee of the School may engage two persons for the academic year 2018-19 for a period of 10 months if the School do not have either Attender or Part-time worker or watchman. One person for maintenance of Toilets & Day Watch &Ward and the other person for Night Watch & Ward.